This is another one of those frustrating cases of a reporter in trouble in China. On one hand, there are the usual reports from western media, NGOs and human rights organizations. On the other hand, little or nothing is being disclosed by the authorities, possibly because they don't feel that it is necessary to debate this case on Internet forums. So how are you supposed to sort this out, given that you don't want to say that the Chinese government is automatically in the wrong unless they can prove otherwise to your satisfaction? In this case, there is an additional piece of investigative journalism to be considered, on top of the standard western media reports. It will be a challenge for you to come up with a firm position. (Strait Times) Journalist not given fair deal for trial, wife says. Strait Times. May 5, 2006. A journalist who reported on alleged local government corruption in central China's Hunan province will go on trial next week without having been able to prepare his defence, his wife said yesterday. The trial of Yang Xiaoqing, who was charged with extortion following his investigations into corruption in Longhui county, will begin on Wednesday, his wife, Ms Gong Jie, said. "He's going on trial but the court has refused his lawyer permission to look at the case documents, so it has been impossible to prepare his defence," Ms Gong said. Court officials were unavailable for comment due to the week-long Labour Day holiday. Yang, 36, a reporter for the China Industrial Economy News, a newspaper under the Communist Youth Party, was detained in January and formally charged with blackmailing and extortion charges in late February. According to his wife, Yang last year wrote two reports alleging local officials in Longhui sold a state-owned food company at a hugely discounted price into private hands. The company was later re-sold at a much higher price with officials and their cronies making big profits, the reports alleged. Ms Gong said the authorities accused Yang of trying to extort money from local officials over their involvement in the case. She insisted he was innocent and that the authorities were intent on silencing and punishing him. China journalist faces charges for corruption report Reuters. April 3, 2006. Journalist held for uncovering corruption, wife says South China Morning Post. April 4, 2006. Yang Xiaoqing to be tried in Longhui County court Committee To Protect Journalists. May 2, 2006. (Phoenix Weekly) Between "Exposing Crimes" and "Extorting Money": The "Double-Faced" Reporter Yang Xiaoqing. April 25, 2006. Issue Number 12, 2006. General Issue Number 217. On February 15, 2006, more than twenty days after Yang Xiaoqing was detained, lawyer Yang Yong met his client in the Hunan province, Longhui county detention center. During the interview, Yang Xiaoqing denied that he was involved in extortion and blackmailing and he ask lawyer Yang to file an "innocent" plea on his behalf. Yang Xiaoqing is a reporter for the China Industrial Economy News. Suspected of "extortion and blackmailing," he was arrested on January 23, 2006 in Changsha by the Longhui county public security bureau. The Longhui county party secretary Yang Jianxin charged that Yang Xiaoqing threatened to publish "negative reports" in an attempt to extort between 500,000 to 800,000 RMB from him. The first person to spread the news of the arrest of Yang Xiaoqing was Yang's wife Gong Jie, an editor at a youth newspaper in Hunan province. On the eve of the Chinese New Year in 2006, she wrote "A Call To Media Reporters Around The Country" to claim that Longhui county party secretary Yang Jianxin used his power to detain a reporter and she asked reporters everywhere to join together to free their colleague and to spread the news on the Internet. She set up her own blog at Sohu.com using the title "The case of reporter Yang Xiaoqing being illegally detained' (note: the blog has been deleted). Gong Jie claimed that her husband was retaliated against for having written negative reports about Longhui. The call by Gong Jie received huge support on the Internet. But this reporter also noted at the same time that there were voices mixed in, as some netizens were inclined to believe that Yang Xiaoqing engaged in extortion. Here is the present reality of journalistic practices in China: some reporters are being retaliated against during the process of investigative reporting but there are also other reporters who are trying to make money through "exposés." Both situations are not rare occurrences. So is Yang Xiaoqing a righteous reporter who dared to expose misdeeds, or was he just the opposite? According to narratives from different "informed sources," there are various explanations about the truth of the matter. Yang Xiaoqing is thirty-seven years old and he originally came from Longhui county, Sangesi town, Sheling village. According to Yang Xiaoqing's elder sister Yang Chunyan, he quit studying after graduating from high school. But he has writing talents and he worked as a temporary reporter at the local television station and then became a private school teacher. During this period, he took three years of correspondence courses and attended the Hunan Province Party School to study Chinese Communist Party history courses. Afterwards, he moved his residence to Changsha. After meeting Gong Jie, Yang Xiaoqing divorced his former wife and seldom returned to his hometown. His cousin Yang Huoping met him most recently on April 5, 2005, when Yang Xiaoqing and Gong Jie returned to the hometown on the Qingming festival to sweep the family graves. On the way from Longhui county city to Sheling village, Yang Xiaoqing told Yang Huoping who works at the courthouse that he has investigated two cases in Longhui county in which state-owned enterprises were privatized with huge losses in national assets and he was ready to publish. Yang Huoping was surprised, because Yang Xiaoqing did not previously consult his relatives about his investigations. Yang Huoping did not agree with the publication of those articles. During lunch, he related this matter to the parents of Yang Xiaoqing. "We said that it is best not to bother with the stuff in your hometown. But Gong Jie said that it will be alright. Gong Jie even had an argument with Yang Xiaoqing's mother over this. Finally, Yang Xiaoqing said that he won't publish it ... he won't publish it." But Yang Xiaoqing did not change his mind on account of this. On May 17, 2005, he published one of those articles about enterprise privatization. Yang Xiaoqing's elder sister Yang Chunyan explained that he was interested in seeking justice. When Yang Xiaoqing was working in Longhui, he had reported on the problem of the wages for private school teachers in the city. But Yang Xiaoqing disclosed during the interview with the lawyer that, on April 2, 2005, that he had already sent the article to the Beijing office of China Industrial Economy News. Right now, it is not clear what happened between April 2 and the Qingming festival three days later to cause Yang Xiaoqing to hesitate about publishing the report. 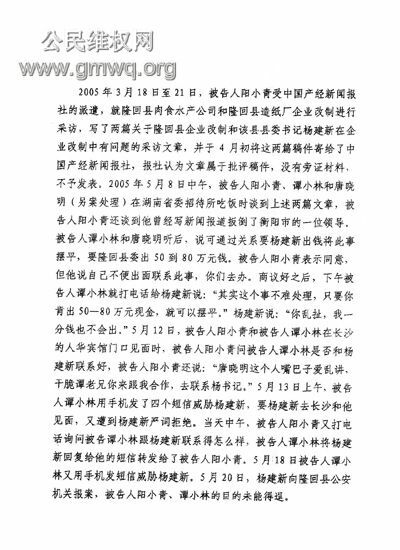 From Yang Xiaoqing's reporter notes, it can be seen that he was in Longhui gathering news about the case of "losses in national assets" between March 21 and March 25, 2005. A certain company and a certain factory in Longhui county were the two privatized companies that Yang Xiaoqing investigated. The two reports that he wrote were titled respectively: "Left hand to right hand passing of national assets -- the investigation of the cheap sale of company X in Longhui, Hunan province" and "The secret behind the 100 million loss in national assets in Longhui: the 100 million versus 10 million 'strange swap'." From the titles, it can be seen that these reports were what local governments call "negative reports." In the report about the privatization of company X, Yang Xiaoqing claimed that individual leaders on the county committee ran a black-box operation and attempted to sell a state enterprise worth 20 million RMB for 4.2 million RMB. In the report about the privatization of that factory leading to a loss of 100 million in national assets, Yang also named people for "supporting the sale of the factory." According to Gong Jie, China Industrial Economy News sent the report to Yang Jinxing and asked him to confirm the contents. But Yang Jianxin used public relations to suppress the article. The China Industrial Economy News reporter liaison office director Wang Xuedong confirmed this: "... it is very simple to negotiate with the newspaper. The person asks for consideration about this and that. We considered the situation, and we did not publish it." Yang Xiaoqing did not give up. He decided to publish in other media. Yang Jianxin quickly learned about this news and took some measures, including sending someone over to dissuade Yang Xiaoqing. The reporter Liu Yuan Yuan who is based in Longhui but works for a Guangdong newspaper said that he called Yang Xiaoqing many times at the behest of Yang Jianxin. "I told him to give up because the investigation was not solid. There was no reliable information for many of the allegations," said Liu Yuan Yuan. Yang Xiaoqing later sent him a SMS to say that he won't be publishing it. But Yang Xiaoqing was just stalling Liu Yuan Yuan. Short after, the report "Left hand to right hand passing of national assets" was published in the Factory Manager Daily on May 15, 2005. Gong Jie later admitted that Longhui officials did come to see Yang Xiaoqing in Changsha to communicate. One official invited Yang Xiaoqing for a meal. "Yang Jianxin even called Yang Xiaoqing by phone. Yang Jianxin said that someone was blackmailing him at the time. Yang Xiaoqing said that if someone was blackmailing him, then he should have them arrested." The person that Yang Jianxin said was "blackmailing" him was Tan Xiaolin. Yang Jianxin told this reporter that he had sent people to see Yang Xiaoqing and he had also warned him over the telephone: "You think you have something on me. But I know what I have done. If you write erroneously, you will bear legal responsibility. The money that you have gotten from other people in the past -- you will not get a cent from me." 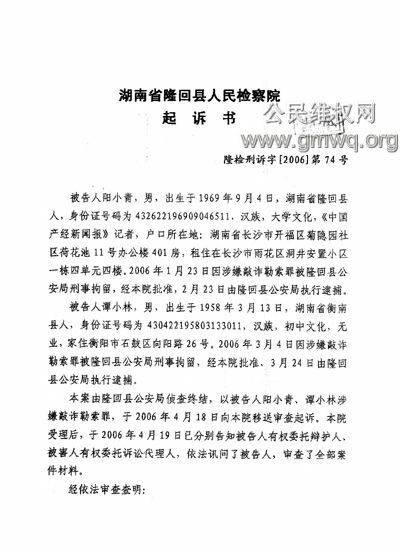 In the report "Report on the extortion case of Yang Xiaoqing" from the Longhui county party propaganda department: "After Yang Xiaoqing saw that he could not intimidate the county party leaders, on May 8, 2005, he got together with Tang Xiaoming and Tan Xiaolin (both of whom are residents of Shegu district, Hengyang city) in the provincial judiciary reception hall and boasted that he was a reporter from the China Industrial Economic News. He said that he had previously used the news media to bring down the former county mayor named Zhang and so on. Then he told Tang and Tan that he has collected some materials about certain problems in the privatization of enterprises on the part of Longhui county party secretary Yang Jianxin and other major leaders. He can use the threat of publishing these materials in the media to force the Longhui county party committee and government to hand over money in the name of sponsoring the Hunan reporter station of China Industrial Economy News. "He said that it was inconvenient for him to do so personally, and so he asked Tang and Tan to go. He promised that he did not care what methods or processes Tang and Tan use, and he only wanted 500,000 to 800,000 for himself. If they can extort even more, the excess will belong to the people who carried it out. Even if it was less than 500,000 RMB, he would still make sure that Tang and Tan are not short-changed. Between May 13 and 18, Tan Xiaolin used multiple telephone calls and SMS's to contact and threaten Longhui county party leader Yang Jianxin to force Longhui county to settle the matter with money." According to Zeng Qingyang, the director of the Longhui county party propaganda department, a couple from a certain railroad unit in Zhangjiajie, Hunan province was trying to find work for their children and asked Yang Xiaoqing for help. They overheard the conversation between Yang Xiaoqing and Tang and Tan in the Hunan provincial judiciary reception hall. Nie Juanli, director of the Longhui county public security office, confirmed to the reporters that they have obtained the testimony of this couple, but he declined to disclose the detailed contents of the testimony. According to Liu Weixiang, director of the Longhui county research office, the content of the SMS's that Tan Xiaolin sent to county party secretary Yang Jianxin were approximately this: "I am a business man. If you need help, I can take care of it for you. I can do it." From the reaction of Yang Jianxin when he received these SMS's, he did not want Tan Xiaolin arrested immediately. He even sent someone from the county to communicate with Yang Xiaoqing in the hope that he would give up publishing the report. Tan was arrested on June 28, 2005, which was 40 days after he sent the SMS's to Yang Jianxin. The news of Tan Xiaolin's arrest quickly reached Yang Xiaoqing and Gong Jie: "When we heard that Tan Xiaolin was secretly sending SMS's to Yang Jianxin, we were very angry," said Gong Jie. He (Yang Xiaoqing) felt that he was dragged in by Tan Xiaolin." Tan Xiaolin is a resident of Shegu district, Hengyang city, but he has been living in Changsha city for a long time. His occupation is unknown. Gong Jie said that around April or May of 2005, through the introduction of Yang Guoqing and Tang Xiaoming of Hengyang city, Yang Xiaoqing got acquainted with Tan Xiaolin. At the time, they had meals together for a few times. Gong Jie claims that Yang Xiaoqing mentioned at the table that he was going to investigate in Longhui but he did not imagine that Tan Xiaolin would come up with the idea of asking Yang Jianxin for money after hearing about this. According to the Longhui county party propaganda department's report, Tan Xiaolin admitted his crime and he claimed that the mastermind was Yang Xiaoqing. From the information provided by the Longhui county party committee, the accusation against Yang Xiaoming for extortion will come mainly from Tan Xiaoling -- the testimony of a "tainted witness." Tan Xiaolin was released after 15 days in detention. During the two months after Tan Xiaolin was released, Yang Xiaoqing lived in fear and terror. Gong Jie said that they learned from friends in Longhui county that Yang Jianxin had hired the gang leaders named Zhang and Peng of Shaodong county to send assassins on four occasions between September and October 2005 to Beijing and Changsha to go after Yang Xiaoqing. But Zeng Qingyang, the director of the Longhui county party propaganda department, denied that Yang Jianxin hired gangsters to "go after" Yang Xiaoqing. "How is that possible? It is not easy to be county party secretary. What happens if something happens when the gangsters go after the other party?" He said that before arresting Tan Xiaolin, they had thought about arresting Yang Xiaoqing as well. But they did not because they considered the fact that arresting a reporter might lead to a social backlash. On December 9, 2005, Yang Xiaoqing made a final bet when he published the two articles on "loss of national assets" as well as two previously unpublished reports titled "800 million RMB poverty relief aid money went into whose pockets?" on the website of Xinxiangbao of Hunan province. On December 28, more than 300 workers at the factory involved in the incident went on a petition march and surrounded the town party committee and government offices for eight hours. Zeng Qingyang said that Yang Xiaoqing's "inaccurate reports" led to frequent petitions in Longhui county and that was why they decided to arrest Yang Xiaoqing. "We discussed this with the public security bureau. I said that we must be careful when we arrest reporters at the provincial level or higher, and we must be serious. The public security apparatus said that there was no problem with arresting him." On January 23, 2006, Yang Xiaoqing was detained in Changsha. Gong Jie immediately issued a call on the Internet on behalf of her husband. Gong Jie's call received the support of certain public opinion websites. Yang Xiaoqing's case became a hot topic of discussion on the Internet. In January 2006, the Hunan province propaganda department instructed the Shaoyang city propaganda to investigate the related circumstances and file a report. The Hunan provincial party disciplinary office also requested the Longhui county party committee to provide a written report about the situation. 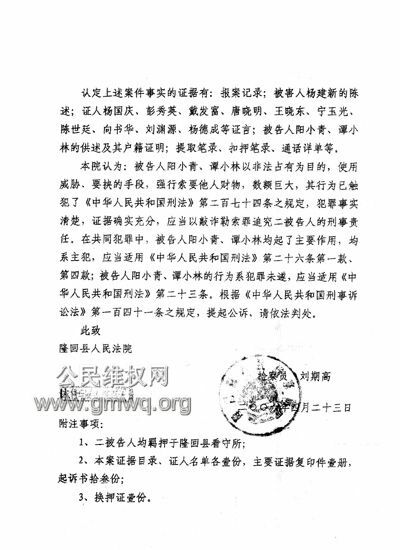 In the "Report about our county arresting Yang Xiaoqing" submitted on January 25 by the Longhui county party committee to the Hunan provincial party disciplinary committee, the beginning was: "For the second half of last year, Yang Xiaoming manufactured certain fictitious materials to pressure our county leaders and he was engaged in blackmail activities." What followed were descriptions of the "inaccurate" reports by Yang Xiaoqing and how they "seriously affected the work of our county for social stability." Lawyer Yang Yong thinks that this shows that the Longhui county party committee still does not have sufficient proof that Yang Xiaoqing was engaged in "extortion and blackmailing." His judgment is supported by the fact when the Longhui county public security bureau went to re-arrest the released Tan Xiaolin, the latter had gone missing. At the beginning of February 2006, they also went to Dongguan in Guangdong province to interrogate the other principal Tang Xiaoming who was working there. On the evening of February 13, 2006, Longhui county party secretary Yang Jianxin told the reporter: "There has been a major breakthrough in the case." Yang Chunyan does not believe that her younger brother Yang Xiaoqing would engage in extortion. The reason was that even though Yang Xiaoqing fought for justice, he was also scared and cautious. He wouldn't dare extort a county party secretary. Besides, if he was accustomed to extorting people, he would not be so poor. According to a certain workers' representative from the factory which Yang Xiaoqing investigated, when Yang Xiaoqing investigated the privatization of the factory, he did not take one cent from them, he did not eat one meal on them and he even paid for the photocopying of the materials himself. Yang Xiaoqing's wife Gong Jie said that Yang Xiaoqing's principle as a reporter was that he will never accept "red envelopes" from the principals of an investigative case. Yang Xiaoqing and his wife rent a place in the suburbs of Changsha. When the Longhui county public security bureau personnel went there to conduct a search, they found the home to be very sparse and ugly. This was very surprising to Zeng Qingyang, the director of the Longhui county party propaganda department. The reporter also learned peripherally that China Industrial Economy News does not have a reporters' station in Hunan province. But Yang Xiaoqing is not a reporter based at a reporters' station. He was usually stationed in Hunan, but his area of coverage was not restricted to Hunan. Gong Jie was unwilling to disclose the structure of Yang Xiaoqing's income. She claimed that she and Yang's income was "passable" and Yang Xiaoqing could not and need not count on "extortion" as a source of income. She said that the report about the "loss of national assets" in Longhui county was the first "critical report" that Yang Xiaoqing wrote after joining China Industrial Economic News in November 2004. Upon persistent questioning by the reporter, she admitted that most of Yang Xiaoqing's income came from "promotion pieces." Such so-called "promotional pieces" appear as news reports but are actually "advertisements" which praise certain officials and enterprises. When these reports are published, the targets must pay a certain amount in fees. Gong Jie said that this was not an individual act on the part of Yang Xiaoqing, because the payment for this type of report went to the newspaper which then forwarded a certain fraction back to Yang. As for the standard rates for these types of reports and Yang's share, Gong Jie said that she does not know. Yang Xiaoqing's cousin Yang Huoping said that Yang Xiaoqing once showed him a booklet on which are posted the various reports that he has published. He remembered deeply that a certain newspaper published a long article written by Yang Xiaoqing in praise of former Longhui county party secretary Wang as well as another article of "praise" for a certain town party secretary in Longhui county. Guangdong newspaper reporter Liu Yuan Yuan told this reporter that he was aware of the progress of this particular report of "praise." In November 25, 2000, Yang Xiaoqing had just arrived in Changsha and he wrote about the problems of the private school teachers in Longhui county. This report criticized then Longhui county party secretary Wang by name. According to Liu Yuan Yuan, Wang was very angry at the time, but he knew that Yang Xiaoqing still had the reports such as "800 million poverty relief aid went into whose pockets?" and so he asked Liu Yuan Yuan to mediate. After being contacted by Liu, Yang Xiaoming went from Changsha to Wang's office in Longhui county. "Last year, I found out that Yang Xiaoqing took 100,000 RMB from Wang," said Liu Yuan Yuan. Another town-level party secretary gave several tens of thousands of RMB too. Longhui county party propaganda department director Zeng Qingyang said that Yang Xiaoqing took money from Wang. But since that was for the purpose of publishing a "promotional report" in exchange for "advertising fees," it cannot be classified as extortion. Longhui county public security bureau director Nie Juanli told our reporter that Yang Xiaoming got the money for sure, but the reason that they arrested Yang this time was mainly for the suspected "extortion" of Yang Jianxin. Yang Xiaoqing's wife Gong Jie admitted that Yang Xiaoqing had written and published the "promotional article" for Wang. She did not think that this was deplorable, because the county has money for promotion and they were willing to spend money on this sort of promotional pieces. She denied that the "promotional articles" came about because Yang Xiaoqing threatened to publish "negative reports." She told the reporter repeatedly about Yang Xiaoqing's sense of justice and the contradictions with the Longhui county government. In the narratives of Longhui county party propaganda department director Zeng Qingyang and others, Yang Xiaoqing had been using the threat of "negative reports" in many county cities of Hunan province and forcing the local officials to pay for "promotional pieces" for a long time. "He did that many times in Longhui," said Zeng Qingyang. "If you pay the advertising fees, it will be alright. If you don't pay up, he'll publish the reports." "Certain newspaper reporters, as well as those hired advertising people, will bring a (critical) article over. If you pay for advertising, it'll be alright. If you won't, they'll publish it. Sometimes, you know that he is not a reporter but we can't do anything about him. Why? Because he can still publish his article through his acquaintances." Zeng Qingyang said that this is a problem within the system. As an impoverished county in China, they must at least encounter more than 10 such incidents each year. "At first, a certain major national media organization created the problem. The advertising people that they hired created a mess. Among my acquaintances, there are some who made a lot of money from this." Yang Xiaoqing's legal representative Yang Yong believes that no matter how common are the incidents of reporters using the threat of negative reporting to extort local officials, this is not the basis for deciding guilt in the specific case of Yang Xiaoqing. If the Longhui county public security bureau is unable to provide concrete evidence, then Yang Xiaoqing should be released. He hopes that the case can be processed in a different locale. In the second half of February 2006, Yang Xiaoqing was approved for arrest by the county procuratorate. A corresponding event was that Yang Jianxin was transferred to become the Political Consultative Committee secretary and office director in Shaoyang city. "The transfer cannot possibly be related to the case of Yang Xiaoqing," said Longhui county public security bureau director Nie Juanli. "This should be a normal job transfer." Certain Hunan media people think that the reason why local reporters can use "negative reports" to extort "advertising fees" is due to existing problems within the local governments. The local government officials are caught by the reporters and that is why they are willing to make payoffs in return for silence. This corroded power deserves attention. Did Yang Xiaoqing really break the law? Was he charged by mistake? Will he be released for lack of evidence? No matter what, the attention on this case from society far exceeds the nature of the case itself. (Associated Press) Chinese journalist gets 1-year prison term. By Audra Ang. June 15, 2006. A Chinese journalist found guilty of extortion after writing articles about official corruption was sentenced Thursday to one year in prison, his wife and lawyer said. Yang Xiaoqing, a reporter for the state-run China Industrial Economy News, was sentenced at the Longhui No. 1 People's Court in Hunan province, his lawyer, Zhang Xingshui said. Yang's wife, Gong Jie, said she would appeal the decision immediately. "It's a terrible thing," Gong said. "He has not committed a single crime. He has not done one thing wrong. To sentence him to even one day of prison is the real crime." She said hundreds of onlookers swarmed the court and blocked police cars to protest the sentence. Some carried signs reading: "Corrupt officials should not bully reporters and the people!" Telephones rang unanswered at the Hunan court Thursday evening. Yang was detained Jan. 22 after being accused by authorities of concocting reports in order to extort the equivalent of up to $100,000 from officials in Longhui county, human rights groups have said. Yang pleaded innocent and has insisted the evidence against him was fabricated. Gong has said Yang was targeted after writing articles accusing Yang Jianxin, a local Communist Party official, of embezzling state assets. Yang, who is not related to the reporter, since has moved to a new post at a government advisory body in nearby Shaoyang city. He has denied framing Yang Xiaoqing. Reporters at China's state-run media pursuing sensitive stories often face violence and harassment, sometimes from local authorities, and often lose their jobs or are detained under unspecified charges. 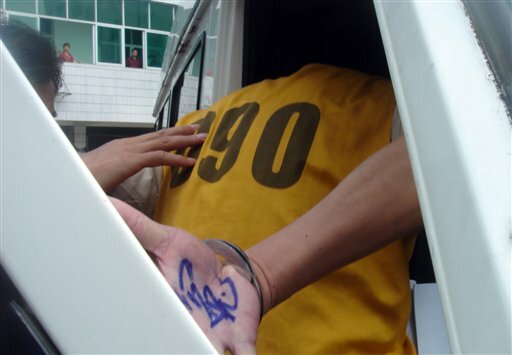 In this photo released by Gong Jie, wife of Yang Xiaoqing showing the handcuffed Yang Xiaoqing with the word "Falsely accused" written in the palm of his hand. (Jurist) China court orders early release of convicted journalist. By Geoffrey C. Leung. October 21, 2006. The Intermediate People's Court [judicial system backgrounder] in the city of Shaoyang has released a Chinese journalist, Yang Xiaoqing, on bail after he served only seven months of his one-year sentence [JURIST report], Yang's wife said Saturday. The court exempted Yang from serving the remainder of his sentence, but did not overturn his conviction. Yang was arrested in January on charges of using news reports exposing local corruption to extort $100,000 and was convicted in June. Yang wrote for the Hong Kong Commerce Daily [media website] about local corruption in the privatization of a state-owned company. The court said that it left Yang's guilty verdict stand because local officials were concerned that Yang would bring a lawsuit against the government.